Text on back reads: "The Grand Trunk Station near Norval, Herb Jackson, Station master, probably around the early 1900s. 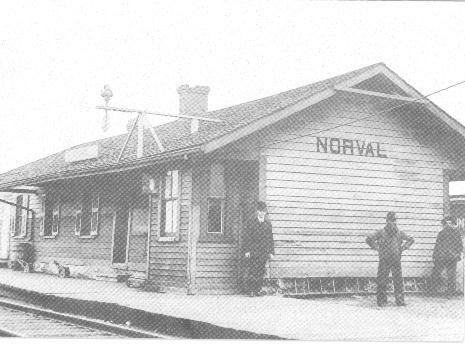 To quote Col. Alex Noble writing of Norval Station business seems to have been flourishing in the village up to the time of the building of the Grand Trunk Railway. This railway, through the bad judgement of those who owned the land which changed the proposed route of the road very close to the south of the Village, to one mile and a half north, put a damper on any further business activities, and built up Brampton and Georgetown as competitors on either side.' What skullduggery had gone on about the selling of land for the railway we will probably never know and the kind old Colonel wasn't about to tell us. However, the Station was a busy one, there was a ticket office with its potbellied stove, a very large Express building, cattle corrals and loaders and a coal shed where you could buy the best quality Nut Anthracite for maybe $3.00 a ton. Coke was cheaper, but it didn't burn clean. In the 1890s a hundred cans of milk a day were shipped from here to Toronto, and if the farmers were slow in loading the cans, the Train Boss, the Conductor, would tap his Elgin watch and yell Shove on your swill' - not very polite, to say the least! scriptby M. Maxwell, R 4 Georgetown, Ontario L7G 4S7"
Physical details: folded card, printed in a pinkish/brownish ink.